March 30, 2019 at 9:07 AM Dry, warm and quiet weather over the weekend. Above normal temperatures and dry conditions will continue this weekend. Unsettled weather returns early next week with the potential for a wetter system late next week. March 29, 2019 at 7:54 AM Today is a permissible burn day in Nevada, Placer, Plumas and Sierra Counties. Burning is always prohibited in the city limits of Grass Valley and Nevada City. A burn permit from the fire department is always required in Truckee. For maximum smoke dispersion, please burn between 9 AM and 3 PM. In the American and Thompson Valleys (all areas within the Quincy Fire Protection District), residential open burning is prohibited until March 16. Burning is always prohibited in downtown Quincy and East Quincy. It is illegal to burn painted or treated wood, plywood, plastic or anything other than natural vegetation from the property where you are burning. It is also illegal to burn piles comprised mainly of leaves or pine needles. For maximum smoke dispersion, please burn between 9 AM and 3 PM. March 29, 2019 at 7:47 AM Dry and sunny weekend ahead before unsettled weather returns next week. Planning your weekend? Quiet weather with dry mountain travel conditions expected. Gradual warming trend heading into the weekend. Temperatures will be 5-12 degrees warmer Sunday compared to today. 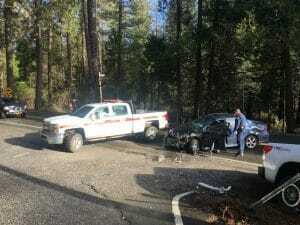 March 28, 2019 at 10:46 AM Truckee Police: Police presence in the area of Donner Center at 11400 Donner Pass Road. Please avoid the area. March 28, 2019 at 8:00 AM Unsettled today, then a gradual warmup. Showers today with snow showers in the mountains. Isolated thunderstorms possible. March 27, 2019 at 10:57 PM Vehicle vs power pole, lines are down on Cameo Drive. PG&E crews on scene, 27 homes out of power. 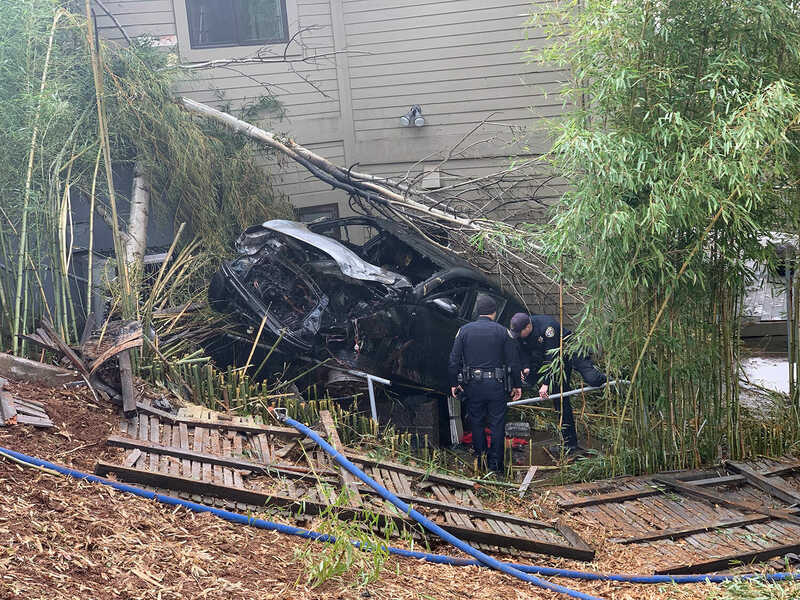 March 27, 2019 at 2:35 PM Accident on Carrie Drive, vehicle into a tree. Emergency services are on scene. March 27, 2019 at 1:50 PM Vehicle spin out on Hwy 20 at the Rough&Ready off ramp. Emergency services on scene. 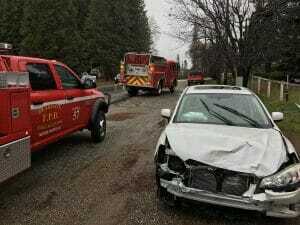 March 27, 2019 at 12:47 PM Accident on Bitney Springs Road near Empress Road, reported as a head on collision between two cars, emergency services on scene. March 27, 2019 at 9:43 AM Resources on scene at Sugar Loaf Road can handle, smoke in the residence only. March 27, 2019 at 9:27 AM Report of a residential structure fire on the 13900 block of Sugar Loaf Road in the Higgins area. Numerous resources en route. March 27, 2019 at 6:58 AM Gusty winds with continued rain and higher elevation snow today. Pacific storm will bring gusty wind with periods of rain and mountain snow today into Thursday, with lingering showers, mainly over the mountains on Friday. Thunderstorms will also be possible today and Thursday. March 26, 2019 at 11:44 AM Solo vehicle accident near Odyssey Lane on Hwy 174, no injuries reported. Emergency services are on scene. March 26, 2019 at 7:14 AM First storm of the week moves out, stronger system arrives tonight. Thunderstorms will be possible across the region on Wednesday. Stronger storms will be accompanied by gusty winds, heavy rain and hail. Precipitation will continue across interior NorCal through Thursday. March 26, 2019 at 7:01 AM Polls are now open until 8:00pm for the Senate District 1 Special Primary Election. 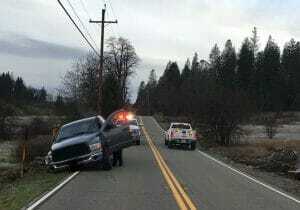 March 26, 2019 at 6:58 AM Accident on Brewer Road near Hwy 49, vehicle vs pole. Emergency services on scene, phone wires are down in the roadway. 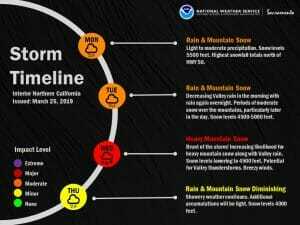 March 25, 2019 at 1:35 PM Updates storm timeline from the NWS in Sacramento. 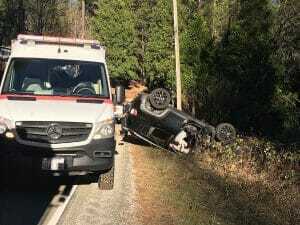 March 25, 2019 at 9:29 AM Emergency services en route to a reported accident on Hwy 20 just west of the Old 5 Mile House. March 25, 2019 at 7:19 AM Wet and unsettled weather this work week. A Winter Storm Warning is in effect thru Tuesday morning. Travel across the Sierra Nevada and southern Cascades will be hazardous during this time and is discouraged. Another storm will bring additional heavy snow Tuesday night through early Thursday. March 25, 2019 at 7:00 AM Today is a permissible burn day in Nevada, Placer, Plumas and Sierra Counties. Burning is always prohibited in the city limits of Grass Valley and Nevada City. A burn permit from the fire department is always required in Truckee. For maximum smoke dispersion, please burn between 9 AM and 3 PM. In the American and Thompson Valleys (all areas within the Quincy Fire Protection District), residential open burning is prohibited until March 16. Burning is always prohibited in downtown Quincy and East Quincy. It is illegal to burn painted or treated wood, plywood, plastic or anything other than natural vegetation from the property where you are burning. It is also illegal to burn piles comprised mainly of leaves or pine needles. For maximum smoke dispersion, please burn between 9 AM and 3 PM. 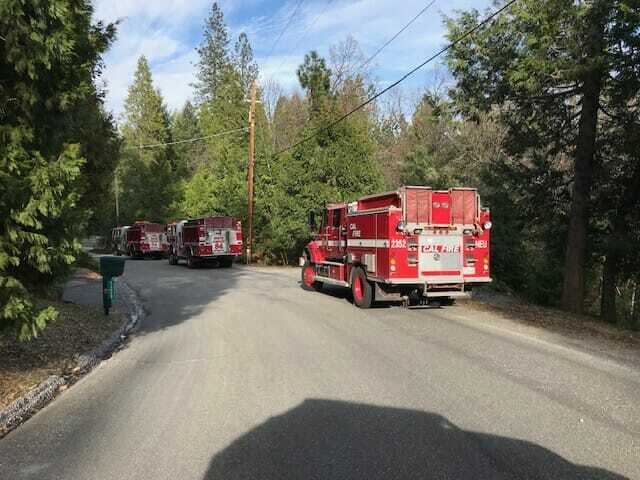 March 22, 2019 at 4:25 PM NCCFD, Grass Valley Fire and Nevada City Fire are at scene of a reported structure fire off of Greenhorn Rd. IC reporting nothing showing, units are investigating. March 22, 2019 at 4:03 PM Roadway is clear again on Brunswick Road and Hwy 174 after a two-car accident. All fire units have been released. CHP is still on scene. March 22, 2019 at 8:30 AM Today is a permissible burn day in Nevada, Placer, Plumas and Sierra Counties. Burning is always prohibited in the city limits of Grass Valley and Nevada City. A burn permit from the fire department is always required in Truckee. For maximum smoke dispersion, please burn between 9 AM and 3 PM. In the American and Thompson Valleys (all areas within the Quincy Fire Protection District), residential open burning is prohibited until March 16. Burning is always prohibited in downtown Quincy and East Quincy. It is illegal to burn painted or treated wood, plywood, plastic or anything other than natural vegetation from the property where you are burning. It is also illegal to burn piles comprised mainly of leaves or pine needles. For maximum smoke dispersion, please burn between 9 AM and 3 PM. March 22, 2019 at 8:04 AM East Bennett is open again. March 22, 2019 at 7:46 AM One lane remains closed on East Bennett. March 22, 2019 at 7:34 AM Accident on East Bennett, car into a ditch. Emergency services are on scene. March 22, 2019 at 6:37 AM Possible mountain travel delays midday through Saturday, wet pattern next week. The next weather system moves through NorCal today through Saturday. Heaviest precipitation is expected on Friday, becoming showery on Saturday. If must travel through the mountains, be prepared for chain controls & travel delays. March 22, 2019 at 6:33 AM Vehicle off the roadway on northbound Hwy 49 at Drunken Miners Road. Emergency services en route. March 21, 2019 at 9:12 PM The #2 lane of northbound Hwy 49 near Lime Kiln is closed after a fatal accident. Numerous emergency services on scene. March 21, 2019 at 9:21 AM Accident on the 11700 block of Ridge Road, vehicle vs pole. No lines down, the roadway is clear. March 21, 2019 at 7:45 AM Next round of wet weather arrives Friday. Wet weather pattern expected to continue through next week with Sunday being the only dry day in the forecast for all of NorCal. March 20, 2019 at 11:07 PM Vehicle rollover on Auburn Road near Godfrey Lane, emergency services are on scene. March 20, 2019 at 4:24 PM First unit at scene on Jayhawk Drive reports major damage to the golf cart, ordering an ambulance as a precautionary measure. Units at scene can handle, incoming units are being canceled. March 20, 2019 at 4:19 PM Golf cart accident on Jayhawk Drive in Rough&Ready. Emergency services en route. March 20, 2019 at 4:11 PM All units have been released from the vehicle accident near Reader Ranch on Hwy 49. March 20, 2019 at 3:48 PM Vehicle accident on Hwy 49 just south Reader Ranch, reported as a multi-vehicle accident. Emergency services en route. 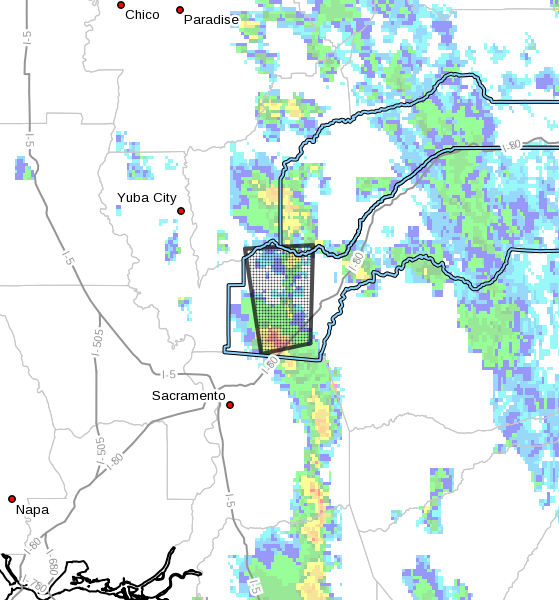 March 20, 2019 at 2:52 PM A strong thunderstorm will affect southwestern Placer, southern Yuba and southwestern Nevada counties. At 2:49 PM PDT, a strong thunderstorm was located over Rocklin, moving north at 25 mph. Pea size hail is possible with this storm. Locations impacted include Roseville, Rocklin, Lincoln, Loomis, Sheridan and Granite Bay. Torrential rainfall is also occurring with this storm, and may cause localized flooding. Do not drive your vehicle through flooded roadways. Frequent cloud to ground lightning is occurring with this storm. Lightning can strike 10 miles away from a thunderstorm. Seek a safe shelter inside a building or vehicle. March 20, 2019 at 2:03 PM Vehicle slid off the roadway on Hwy 174 at Redberry Road just north of the Bear River Bridge. Emergency services are on scene. March 20, 2019 at 11:41 AM Non-injury accident on westbound Hwy 20 at Penn Valley Drive, vehicle into a tree. Emergency services are on scene, use caution in the area. March 20, 2019 at 7:45 AM Light rain and mountain snow on this first day of Spring. A slight threat of thunderstorms exists over interior northern California this afternoon as a Pacific low pressure system moves through the region. Although most shower activity today will be light, thunderstorms could bring brief periods of heavy rain and small hail. The Vernal equinox occurs today at 2:58 PM PDT. 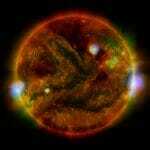 This is the time the sun passes over the celestial equator. Astronomical spring starts today. March 20, 2019 at 7:30 AM Today is a permissible burn day in Nevada, Placer, Plumas and Sierra Counties. Burning is always prohibited in the city limits of Grass Valley and Nevada City. A burn permit from the fire department is always required in Truckee. For maximum smoke dispersion, please burn between 9 AM and 3 PM. In the American and Thompson Valleys (all areas within the Quincy Fire Protection District), residential open burning is prohibited until March 16. Burning is always prohibited in downtown Quincy and East Quincy. It is illegal to burn painted or treated wood, plywood, plastic or anything other than natural vegetation from the property where you are burning. It is also illegal to burn piles comprised mainly of leaves or pine needles. For maximum smoke dispersion, please burn between 9 AM and 3 PM. March 19, 2019 at 10:59 AM Placer County Deputies and detectives are on scene in Colfax for an apparent burglary of an occupied home. The homeowner fled the residence and a suspect has been detained after a fire was started inside. More info to follow. March 19, 2019 at 10:50 AM Air Attack and air tankers are training over the area again today. The planes are still based at McClellan where they are overhauled during winter. March 19, 2019 at 10:38 AM Structure fire in Colfax on Hill Haven Drive. Black smoke and possible propane tanks exploding. Numerous engines arriving on scene. March 19, 2019 at 7:33 AM Today is a permissible burn day in Nevada, Placer, Plumas and Sierra Counties. Burning is always prohibited in the city limits of Grass Valley and Nevada City. A burn permit from the fire department is always required in Truckee. For maximum smoke dispersion, please burn between 9 AM and 3 PM. In the American and Thompson Valleys (all areas within the Quincy Fire Protection District), residential open burning is prohibited until March 16. Burning is always prohibited in downtown Quincy and East Quincy. It is illegal to burn painted or treated wood, plywood, plastic or anything other than natural vegetation from the property where you are burning. It is also illegal to burn piles comprised mainly of leaves or pine needles. For maximum smoke dispersion, please burn between 9 AM and 3 PM. March 19, 2019 at 7:31 AM Last day of dry and mild weather today. Wet week ahead for NorCal. Warm & dry conditions continue through today before a weather system impacts the area tonight – early Thursday. Another system is possible Friday – Saturday. March 18, 2019 at 7:24 PM Firefighters on scene at Table Meadow are making good progress. No need for PG&E crews, no damage to the power infrastructure. March 18, 2019 at 7:20 PM Barn on fire on Table Meadow Road in the Higgins area. Engines en route. Nevada State Veterinarian JJ Goicoechea has received reports of two more confirmed cases of EHV-1 in Nevada and has quarantined two additional horse facilities in Clark County. All horse owners in Nevada are urged to take temperatures on horses at least twice a day and check for signs of respiratory disease. More recommendations from Dr. Goicoechea related to horse events and boarding may follow in the coming days in efforts to slow the spread of EHV-1, which can cause neurologic disease in horses. March 18, 2019 at 4:46 PM Fully involved commercial truck on Hwy 49 at Joeger Rd. One additional water tender requested. March 18, 2019 at 2:19 PM Grass Valley Air Attack Base is not operational yet, the air tankers and air attack have come up from their winter quarters at McClellan for training only. March 18, 2019 at 2:10 PM A garbage truck has struck low-hanging power lines on South Auburn Street in Grass Valley. Emergency services are en route. Use caution in the area. March 18, 2019 at 2:07 PM Ambulance requested to the reported vegetation fire on Lazy Oaks Drive for a possible smoke inhalation. 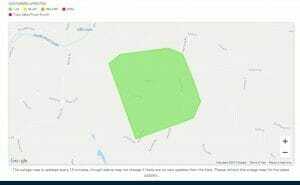 March 18, 2019 at 1:53 PM Reported vegetation fire, escaped control burn – less than 1 acre – on Lazy Oaks Drive off Excelsior Ditch Camp Road. Units en route. Homeowner reports the fire escaped the line and is now burning in manzanita. March 18, 2019 at 12:56 PM Report of an escaped burn pile on Blue Tent School Road. Three engines, one Battalion Chief and a Prevention Officer en route. March 18, 2019 at 7:23 AM Vehicle accident on southbound Hwy 49 at Rush Creek Way (past Newtown Road). Car into the embankment, emergency services are en route. March 18, 2019 at 6:30 AM Today is a permissible burn day in Nevada, Placer, Plumas and Sierra Counties. Burning is always prohibited in the city limits of Grass Valley and Nevada City. A burn permit from the fire department is always required in Truckee. For maximum smoke dispersion, please burn between 9 AM and 3 PM. In the American and Thompson Valleys (all areas within the Quincy Fire Protection District), residential open burning is prohibited until March 16. Burning is always prohibited in downtown Quincy and East Quincy. It is illegal to burn painted or treated wood, plywood, plastic or anything other than natural vegetation from the property where you are burning. It is also illegal to burn piles comprised mainly of leaves or pine needles. For maximum smoke dispersion, please burn between 9 AM and 3 PM. March 18, 2019 at 6:25 AM Wet weather returns Tuesday night. Multiple weather systems will bring Valley rain & mountain snow Tuesday evening through the weekend. March 17, 2019 at 8:54 PM Fire engines en route to a structure fire, reported as a motorhome on fire at a construction site, on Voyageur Way or possibly Wild Turkey Lane off Hwy 20. March 17, 2019 at 5:14 PM Thanks to Cascade Shores resident Rick for the photo. Firefighters have contained the 1/4 acre fire on Gas Canyon Road and are mopping up. March 17, 2019 at 4:24 PM Firefighters are hiking in to the reported fire on Gas Canyon Road. No report of size yet. March 17, 2019 at 4:14 PM Reported vegetation fire on Gas Canyon Road in Cascade Shores, apparently started by a spark from a chainsaw. Three engines, Battalion 1, Battalion 2314 and Prevention Officer en route. Unknown size, burning in grass and brush. 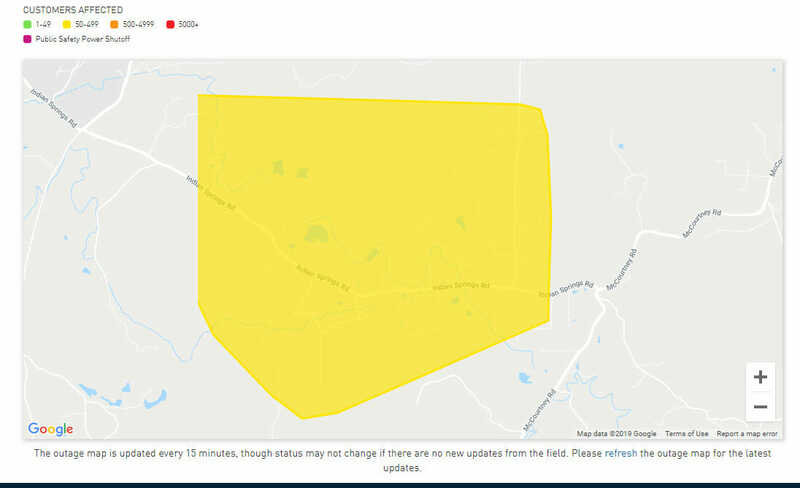 March 17, 2019 at 9:29 AM 90 customers out of power on Red Dog Road between Crystal Wells and Quaker Hill just outside of Nevada City. PG&E repair crew is on-site working to restore power. Estimated time of restoration is noon today. Nevada County Consolidated Fire, @CHPValleyAirOps along with North San Juan Fire are at the S. Fork of the Yuba River near Hwy 49 on scene of a Medical Rescue. Stay clear of emergency operations. March 15, 2019 at 9:27 PM non-injury accident, vehicle into a ditch on Perimeter Road, 500 ft from the intersection with McCourtney Road. March 15, 2019 at 2:45 PM Thanks to reader Delia for this picture of Englebright Reservoir spilling over. Current water level is 528.44 feet, 6.04 ft above the full pool level of 522.40 – spilling will continue through the weekend. 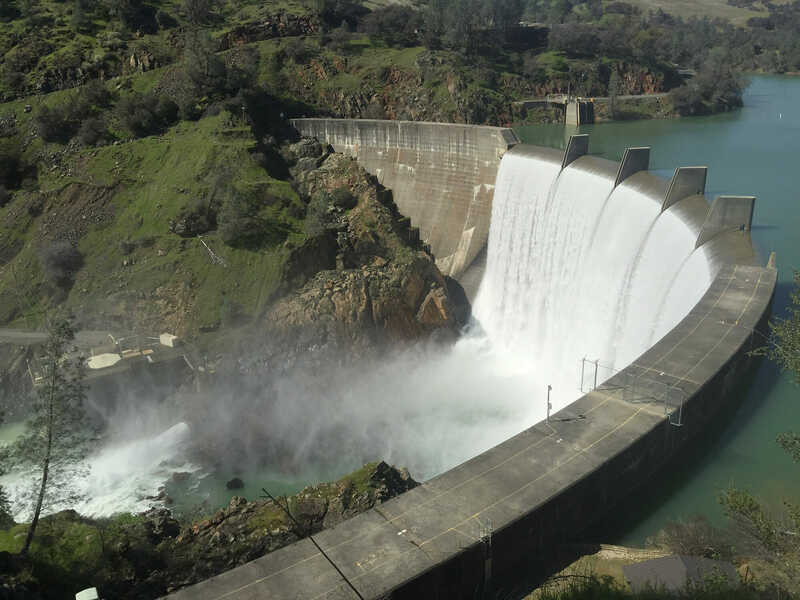 The current release rate is 3,410 cfs, with a spill of 2,573 cfs. The reservoir currently stores 71,103 acre feet of water or 23,169,014,013.98 gallons – enough to fill 35,091.11 Olympic-size swimming pools. March 15, 2019 at 2:06 PM 111 homes out of power on Wolf Road. PG&E has assigned a crew to assess the outage. Tentative time of restoration is 5:00 pm. March 15, 2019 at 1:02 PM Only 4 homes still out of power on Banner Lava Cap Road. PG&E crew is on site. Estimated time of restoration is 3:00 pm. The outage affected up to 850 customers. March 15, 2019 at 7:49 AM A fire truck lost a hose on Hwy 174 at You Bet Road. Use caution in the area. March 15, 2019 at 7:22 AM Warming trend continues into the weekend. Highs will be near average for this time of year. March 15, 2019 at 7:15 AM A dead deer in the middle of the roadway on Ridge Road near Pear Orchard Way. Drivers are swerving around it, use extreme caution in the area. March 14, 2019 at 6:10 PM Vehicle off the roadway on southbound Pleasant Valley Road near Bitney Springs Road. Passersby have stopped to assist. Emergency services en route. March 14, 2019 at 5:42 PM Animal hazard reported on Rock Creek Road near Hobnob Way. Uni en route. March 14, 2019 at 8:29 AM Happy Pi day! March 14, 2019 at 8:04 AM Drying out and warming up. Dry weather and milder temperatures expected through the weekend as ridge moves onshore. Some increase in cloudiness is expected later today into Friday as a system weakens moving into the ridge. March 13, 2019 at 8:33 PM Debris from an earlier accident is causing a traffic hazard at the Hwy 49/20 intersection in Nevada City. March 13, 2019 at 6:33 PM East Bennett has been reopened in both directions, one oatient has been transported to Sutter Roseville trauma center. March 13, 2019 at 5:42 PM Vehicle rollover on East Bennett, car is on its roof. Emergency services on scene, use caution in the area. March 13, 2019 at 4:25 PM Non-injury accident on westbound Lowell Hill Rd / Dutch Flat Crossing Rd. Two vehicles, emergency services on scene. March 13, 2019 at 7:41 AM Breezy northerly winds will continue across the region today. Upper ridge moves overhead Thursday resulting in lighter winds and gradually milder temperatures heading into the weekend. 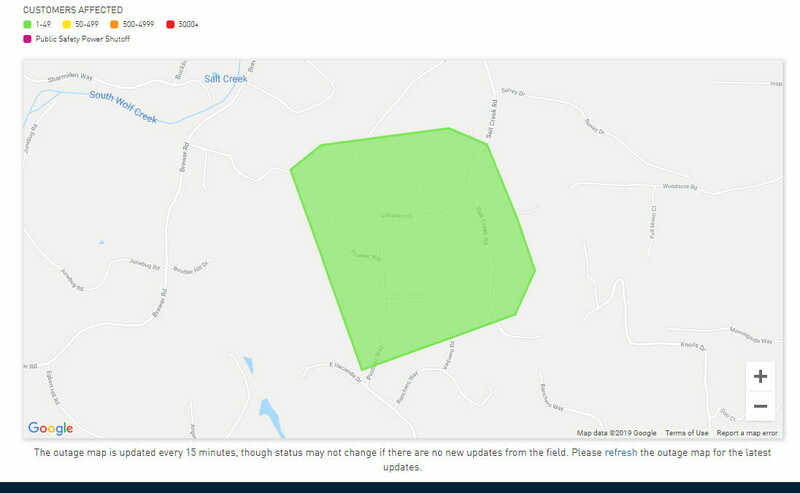 March 12, 2019 at 7:35 PM 195 customers out of power in Michigan Bluff and on Foresthill Road. Estimated time of restoration is 11:00 pm. PG&E is sending a repair crew to the outage location. March 12, 2019 at 6:38 PM Non-injury accident on Brunswick Road at Loma Rica Drive, vehicles are on the side of the road. March 12, 2019 at 5:20 PM Rain and snow showers will continue to move through the Sierra and western Nevada this evening. Some light snow accumulations are possible above 5000 feet. However once the rain and snow showers diminish later this evening, temperatures will fall below freezing. A light coating of water on roads and temperatures falling below freezing will increase the potential for areas of black ice to form tonight and Wednesday morning. Plan to allow extra time for travel. March 12, 2019 at 10:40 AM The retirement of Nevada County Counsel has been announced, effective November 2019. March 12, 2019 at 7:40 AM Light showers possible today, breezy north winds usher in extended period of dry weather. Once a quick moving weak frontal system moves through NorCal today, breezy north winds will develop. These breezy north winds are expected to last through Wednesday then decrease on Thursday. March 11, 2019 at 11:47 AM Heads up, PG&E crews working on Banner Lava Cap Road near Lake View Road. Use caution in the area. March 11, 2019 at 8:12 AM Today is a permissible burn day in Nevada, Placer, Plumas and Sierra Counties. Burning is always prohibited in the city limits of Grass Valley and Nevada City. A burn permit from the fire department is always required in Truckee. For maximum smoke dispersion, please burn between 9 AM and 3 PM. In the American and Thompson Valleys (all areas within the Quincy Fire Protection District), residential open burning is prohibited until March 16. Burning is always prohibited in downtown Quincy and East Quincy. It is illegal to burn painted or treated wood, plywood, plastic or anything other than natural vegetation from the property where you are burning. It is also illegal to burn piles comprised mainly of leaves or pine needles. For maximum smoke dispersion, please burn between 9 AM and 3 PM. March 11, 2019 at 4:26 AM Dry today, light precip on Tuesday before an extended period of dry weather. A weak weather system will be dropping through Northern California on Tuesday bringing light rain and snow. Minor trans-Sierra travel impacts will be possible Tuesday through Tuesday evening. After that, dry and warmer weather is expected through at least next weekend. Crews are clearing the scene of a successful large animal rescue in South County. The horses fell into an NID ditch and was stuck in the water and mud. Attentive neighbors came to the aid of the horse and called 911 and our Large Animal Rescue unit responded. No ditch damage! March 10, 2019 at 4:23 PM At 420 PM PDT, radar indicated strong thunderstorms were located along a line extending from Smartville to near Auburn to near Latrobe. Movement was southwest at 10 mph. Pea size hail with significant ground accumulation is possible with these storms. Locations impacted include: Roseville, Folsom, Rocklin, Auburn, El Dorado Hills, Cameron Park, Lincoln, Loomis, Rancho Murieta, Rescue, Pilot Hill, Latrobe, Newcastle, Hammonton, Natomas, Beale AFB, Orangevale, Smartville, Granite Bay and Timbuctoo. March 10, 2019 at 10:12 AM We are receiving numerous reports about a yellow orb in the sky. 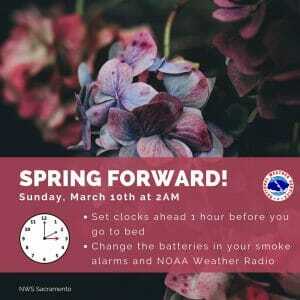 By the way, when you change your clocks for #DaylightSaving take the time to check your smoke alarms. It can make all the difference during a fire emergency. March 10, 2019 at 9:43 AM All fire personnel has been released from the two-car accident near the Calvary Church. Use caution in the area and watch for equipment leaving the scene. Tow trucks are removing the two damaged cars, no injuries reported. 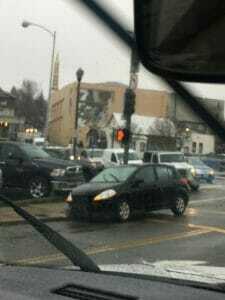 March 10, 2019 at 9:10 AM Accident on Hwy 174 in front of the Calvary Church. Emergency services on scene, waiting for a tow. PG&E crews inspecting the damage to the power pole. March 9, 2019 at 8:53 PM Reader reports a tree across the roadway on Post Chaise Circle, in the power outage area of Clydesland Road. 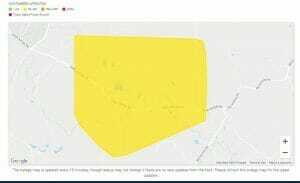 March 9, 2019 at 8:28 PM 37 homes out of power on Taylor Crossing and Clydesdale Road. PG&E has assigned a crew to assess the outage. 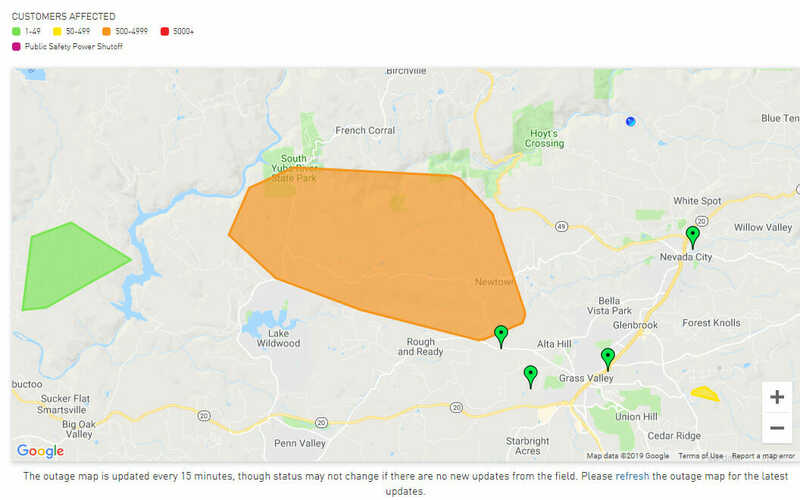 March 9, 2019 at 7:08 PM 36 homes without power along Salt Creek and Pioneer Way. Unknown cause, PG&E has assigned a crew to assess the outage. No estimated time of restoration yet. March 9, 2019 at 6:59 PM 234 homes out of power along Indian Springs Road off McCourtney. PG&E has assigned a crew to assess the outage. 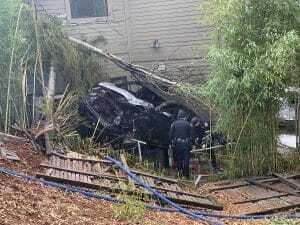 March 8, 2019 at 2:57 PM Driver who crashed into a home in Morgan Ranch was transported to Sutter-Roseville. Firefighters mitigated the exposure to the home. The cause of the accident is under investigation. 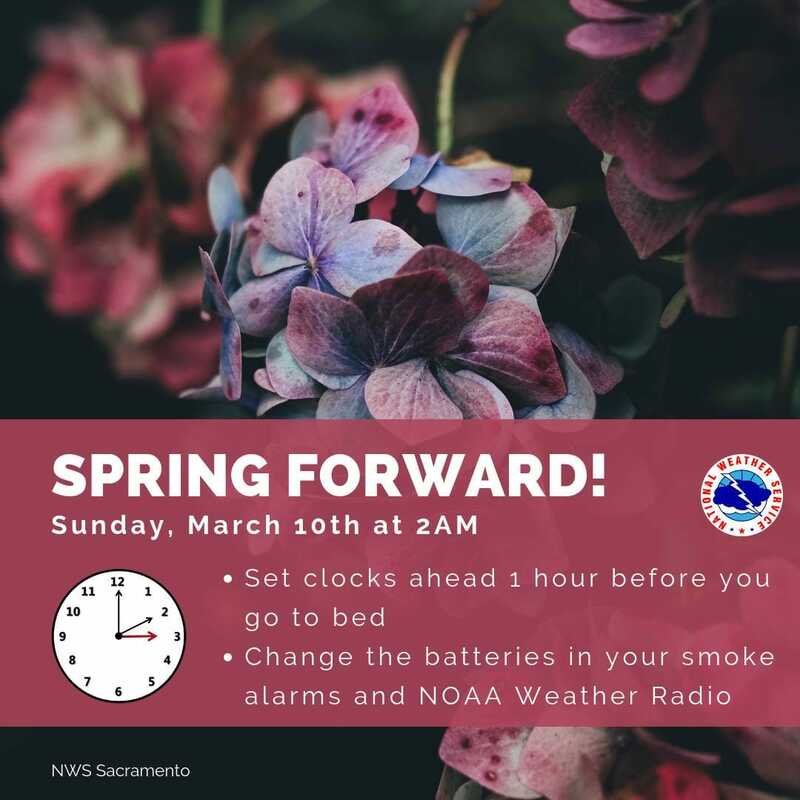 March 8, 2019 at 10:00 AM Don’t forget to “Spring Forward” tomorrow evening. March 8, 2019 at 7:50 AM Scattered showers today, light snow showers possible tonight. Wet weather continues through the weekend for NorCal. A brief break today for Valley locations before another weak weather system moves in Saturday. Periods of mountain snow expected thru Sunday, heaviest tonight & Saturday over mountain areas north of interstate 80. 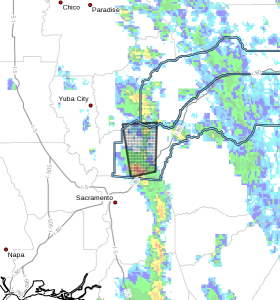 March 7, 2019 at 1:22 PM NWS Sacramento update: A disturbance will bring more showers and isolated thunderstorms today and tonight, especially over the mountains and foothills. The best chances for thunderstorms with heavy rain will be over the southern Motherlode areas. Streams are running high and additional heavy rain could cause more stream flooding. Hazardous mountain travel with snow levels down to 4000 feet will be possible. A weak system will bring light showers and light Sierra snow over the weekend. 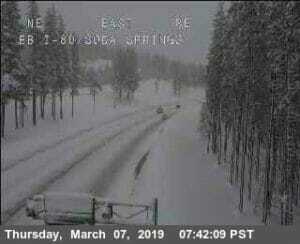 March 7, 2019 at 7:43 AM Chain controls are still in effect on I-80 and on Hwy 20 from the Omega overlook to the junction of I-80. March 7, 2019 at 7:18 AM Lingering showers through the weekend. A Winter Weather Advisory is in effect until 6 PM this evening, snow showers will continue across the mountains through Friday. 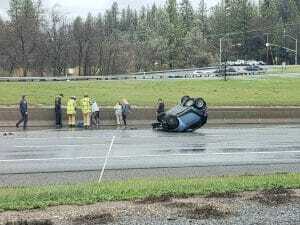 March 6, 2019 at 11:17 AM Overturned sedan on eastbound I-80 at the Bell Road off ramp. Emergency services on scene. Thanks to reader Norm for the photo. 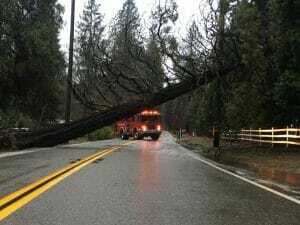 March 6, 2019 at 11:14 AM Tree down on Hwy 49 at Cleveland Ave in Camptonville. All lanes are blocked. 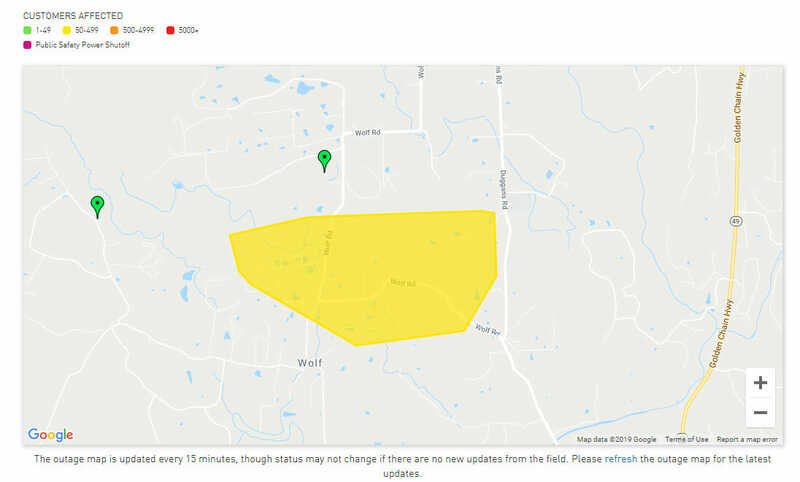 March 6, 2019 at 11:13 AM Outage on Bitney Springs and Pleasant Valley Road has been reduced to 102 customers. 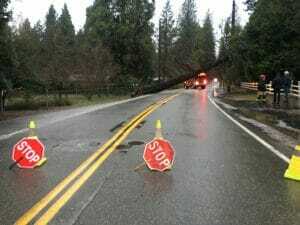 March 6, 2019 at 11:03 AM Greenhorn Road remains closed near Hollydale, reopening later this afternoon. 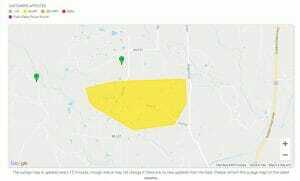 March 6, 2019 at 9:41 AM 882 customers out of power along Newtown Road and Bitney Springs. PG&E has assigned a crew to assess the outage. March 6, 2019 at 9:37 AM A school bus is blocking the westbound lane on Ridge Road at Canyon View Drive. Traffic control is in place. March 6, 2019 at 9:35 AM Caltrans has shut down the roadway on Hwy 49 at Francisco Lane on the San Juan Ridge due to a mud and rock slide. March 6, 2019 at 8:57 AM 162 homes out of power in Chicago Park, including Chicago Park School, according to a reader. PG&E is assessing the cause at the outage location. No estimated time of restoration. March 6, 2019 at 8:46 AM PG&E crew is on site at Greenhorn Road, CHP Grass Valley is handling traffic control. March 6, 2019 at 7:43 AM A yard of gravel has washed into the road and road flooding on Penn Valley Drive at Spenceville Road, Nevada County Public Works en route. Reduce your speed and use extreme caution in the area. March 6, 2019 at 7:15 AM Greenhorn Road is blocked at Hollydale Road. Emergency services are on scene. March 6, 2019 at 7:14 AM Thunderstorms, breezy winds and high-elevation snow today. Thunderstorms are possible today, especially if there is enough clearing in the morning hours. Stronger thunderstorms will be possible in the Valley with heavy rain, large hail, and a chance of an isolated tornado. A Winter Storm Warning is in effect from Tuesday afternoon through Thursday morning. Travel across the Sierra Nevada will be hazardous during this time is is highly discouraged. March 6, 2019 at 7:00 AM Chains required on I-80 from Kingvale to Donner Lake interchange. March 5, 2019 at 10:01 PM Power lines are down on Rough&Ready Hwy and a second car collided with the first one. March 5, 2019 at 9:56 PM Vehicle into a power pole on Rough&Ready Hwy, emergency services en route. March 5, 2019 at 3:18 PM Jennifer Montgomery, 58, of Donner Summit, has been appointed director of the Governor’s Forest Management Task Force. Montgomery has served as the 5th District Supervisor on the Placer County Board of Supervisors since 2009. 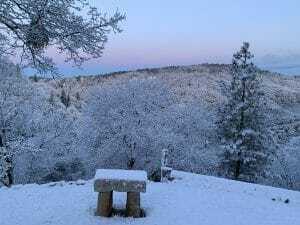 From 2000 to 2008, she owned her own business, “Three Sheets to the Wind”, which provided property management services to people in the Donner Summit area. From 1999 to 2000, she worked at the Sierra Business Council. This position does not require Senate confirmation and the compensation is $165,000. Montgomery is a Democrat. March 5, 2019 at 12:35 PM As a reminder, Extreme Weather Shelter for Homeless Residents to Open Tuesday and Wednesday. March 5, 2019 at 7:40 AM Today is a permissible burn day in Nevada, Placer, Plumas and Sierra Counties. Burning is always prohibited in the city limits of Grass Valley and Nevada City. A burn permit from the fire department is always required in Truckee. For maximum smoke dispersion, please burn between 9 AM and 3 PM. In the American and Thompson Valleys (all areas within the Quincy Fire Protection District), residential open burning is prohibited until March 16. Burning is always prohibited in downtown Quincy and East Quincy. It is illegal to burn painted or treated wood, plywood, plastic or anything other than natural vegetation from the property where you are burning. It is also illegal to burn piles comprised mainly of leaves or pine needles. For maximum smoke dispersion, please burn between 9 AM and 3 PM. March 5, 2019 at 7:39 AM Moderate to heavy rain and mountain snow late today through Wed with possible flooding. With heavy rain expected Tuesday night through Wednesday, a Flood Watch has been issued. In the Valley, areas may receive 1 to 3 inches of rain, with locations in the foothills seeing 2 to 5 inches. Multiple feet of snow are expected for the Sierra as NorCal sees another wet system. Snow starts later today and will be heaviest tonight into Thursday morning. If you have mid-week mountain travel plans be sure to keep up with the forecast. March 4, 2019 at 12:11 PM Truck partially blocking the roadway on Quaker Hill Cross Road at Crystal Wells Road. March 4, 2019 at 11:09 AM Two dogs wandering in the roadway on southbound Hwy 49 at Linnet Lane. Please use extra caution in the area. March 4, 2019 at 9:51 AM Today, Yuba River Ranger District will be conducting prescribed pile burning within the Pendola Area (47 Road) and Bullards Bar Work Center (Vista Point). Smoke will be visible from Marysville Road and Bullards Bar Reservoir. Fire personnel and apparatus will be on scene, please drive with extra caution when traveling through this area. March 4, 2019 at 8:56 AM Foresthill Bridge is open t traffic again. March 4, 2019 at 8:45 AM Foresthill Bridge is closed to traffic due to a suicidal subject in the center of the bridge. Emergency services are on scene. March 4, 2019 at 7:23 AM Today is a permissible burn day in Nevada, Placer, Plumas and Sierra Counties. Burning is always prohibited in the city limits of Grass Valley and Nevada City. A burn permit from the fire department is always required in Truckee. For maximum smoke dispersion, please burn between 9 AM and 3 PM. In the American and Thompson Valleys (all areas within the Quincy Fire Protection District), residential open burning is prohibited until March 16. Burning is always prohibited in downtown Quincy and East Quincy. It is illegal to burn painted or treated wood, plywood, plastic or anything other than natural vegetation from the property where you are burning. It is also illegal to burn piles comprised mainly of leaves or pine needles. For maximum smoke dispersion, please burn between 9 AM and 3 PM. March 4, 2019 at 7:19 AM Dry today, wet weather returns late Tuesday. Drier weather is expected across much of the region today, but rain moves back in later Tuesday and we’ll see wet weather thru mid-week. March 4, 2019 at 7:00 AM Preparing for Wildfire Season in Nevada County – Week 13: Neighborhood awareness. Next time when you sit in the passenger seat, instead of looking at the road, look up. Are trees leaning over the roadway or power and phone lines crossing overhead? Then, look around. 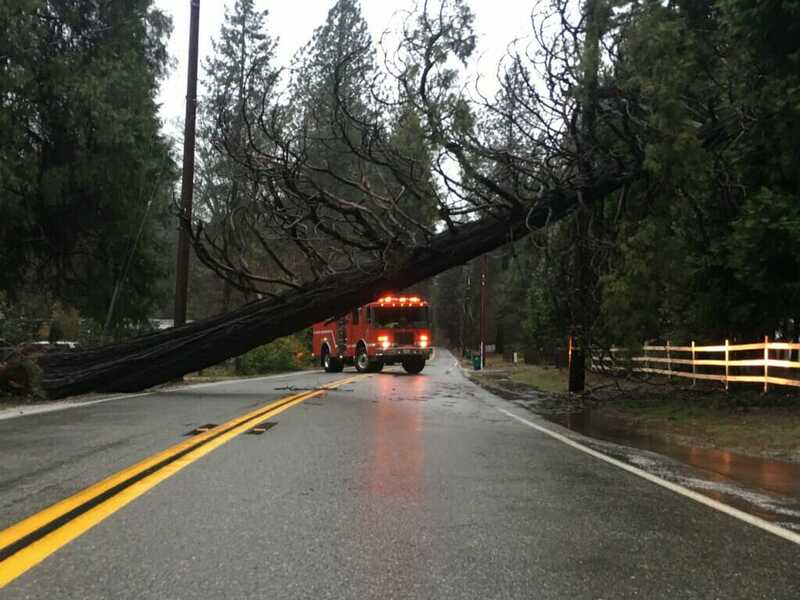 March 3, 2019 at 8:47 PM Vehicle into a tree on Lawrence Way near Norlene Way in Alta Sierra. Emergency services on scene. March 3, 2019 at 2:14 PM Today crews from NCC @grassvalleyfirefighters and @calfireneu battled a house fire in #GrassValley Crews arrived at scene to find a 3 story residence with smoke showing. Fire attack was established, all while accounting for the occupants which were self evacuated. Two cats and a Guinea pig we removed from the structure by fire crews and are in great condition! The fire is still under investigation but was extinguished with minimal extension to the rest of the residence. 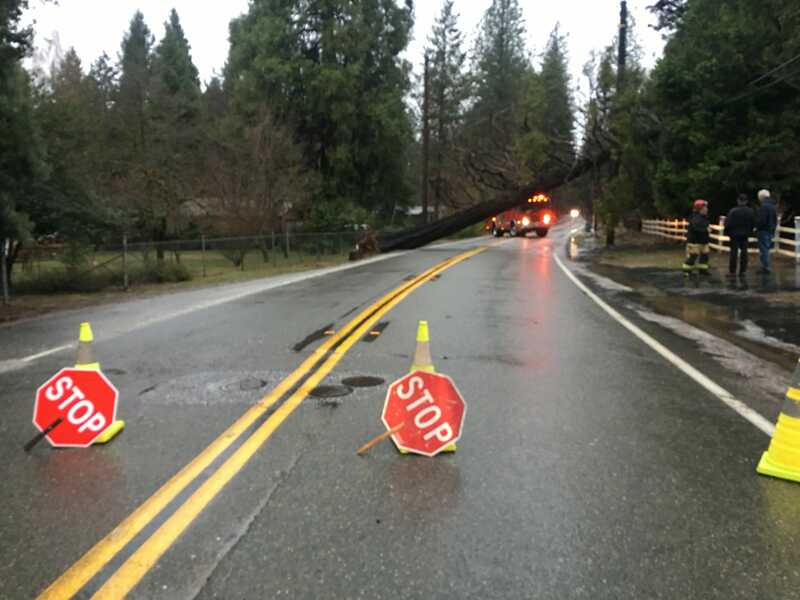 March 3, 2019 at 12:53 PM Tree in the roadway on Banner Quaker Hill near Banner Lava Cap Road, the westbound lanes are blocked. March 3, 2019 at 10:11 AM Moderate to heavy rain and mountain snow Tue and Wed with strong wind and possible flooding. Scattered rain showers and mountain snow showers will continue today into early Monday with travel impacts in the mountains. Mainly dry Monday into Monday night, then a series of wet storms impact Northern California beginning wet weather Tuesday into Friday. A wet atmospheric river looks to impact California Tuesday into Wednesday with periods of moderate to heavy precipitation. Forecast models suggest the heaviest precipitation with the atmospheric river will impact central and southern portions of the state. Additional weaker storms will continue light to moderate precipitation over interior Northern California Thursday into Friday. March 3, 2019 at 10:04 AM 360 homes out of power along the I-80 corridor from Blue Canyon to Cisco Grove. PG&E is assessing the cause at the outage location, no estimated time of restoration provided. 71 homes out of power along the Hwy 49 corridor from Goodyears Bar to Sierra City. PG&E repair crew is en route to the outage location, no estimated time of restoration provided. March 2, 2019 at 4:22 PM Accident on South Auburn and Neal Street in Grass Valley, blocking one lane. Grass Valley Police is on scene. 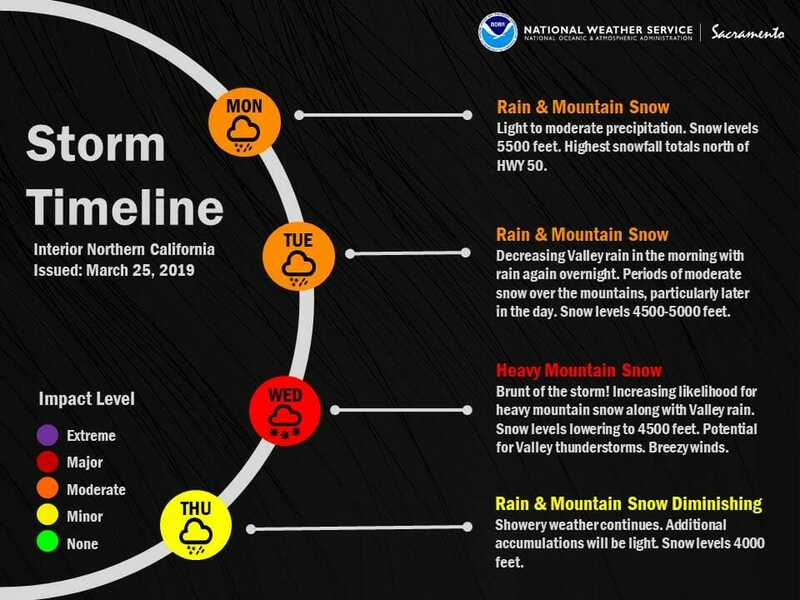 March 2, 2019 at 10:24 AM Rain and mountain snow today, next significant storm arrives late Tuesday. Hazardous mountain travel conditions are likely as a winter storm impacts the region this weekend. Be prepared for travel delays & chain controls. A brief break is expected Monday before a wetter multi-day system begins Tuesday, becoming heavier on Wednesday. March 1, 2019 at 7:26 PM Extreme Weather Shelter for Homeless Residents to Open Tuesday and Wednesday. In an effort to collaborate over one of our most vulnerable populations, the City of Nevada City, Sierra Roots, and the County of Nevada initiated their Extreme Weather Shelter Protocol for Tuesday and Wednesday nights, March 5th through the morning of March 7th. This is an effort to continue to temporarily shelter homeless residents in our community during extreme weather. Hours of operation are 4:30 p.m. through 7:30 a.m. the next morning. March 1, 2019 at 7:39 AM Minor storm over the weekend, next AR arrives Tuesday. A Winter Storm Warning or Winter Weather Advisory is in effect for portions of the Sierra Cascade range this weekend. Snow amounts of 6 to 18 inches will be possible with local amounts up to 2 feet. March 1, 2019 at 12:02 AM Today is a permissible burn day in Nevada, Placer, Plumas and Sierra Counties. Burning is always prohibited in the city limits of Grass Valley and Nevada City. A burn permit from the fire department is always required in Truckee. For maximum smoke dispersion, please burn between 9 AM and 3 PM. In the American and Thompson Valleys (all areas within the Quincy Fire Protection District), residential open burning is prohibited until March 16. Burning is always prohibited in downtown Quincy and East Quincy. It is illegal to burn painted or treated wood, plywood, plastic or anything other than natural vegetation from the property where you are burning. It is also illegal to burn piles comprised mainly of leaves or pine needles. For maximum smoke dispersion, please burn between 9 AM and 3 PM. March 1, 2019 at 12:00 AM You can find last month’s log here.